Calling all cookies and cream fans! 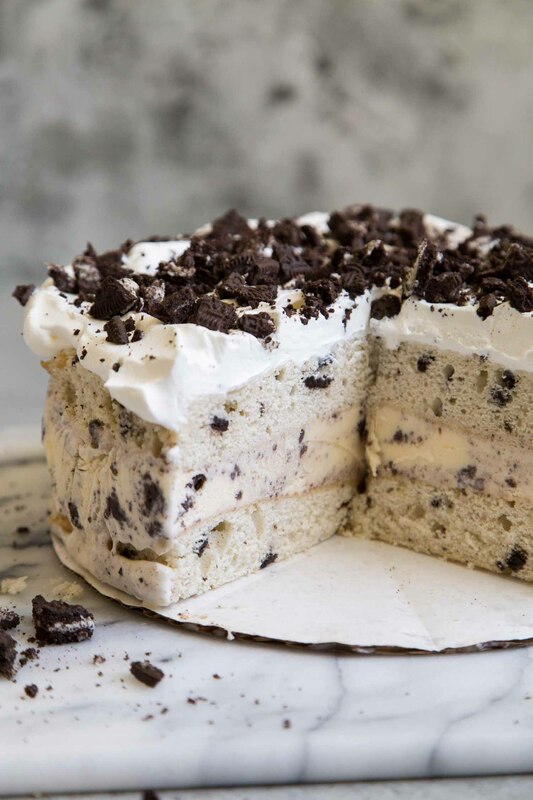 This cookies and cream ice cream cake features a generous serving of ice cream sandwiched between two sweet cake layers. Growing up, ice cream cakes from Baskin-Robbins were all the rage. (We didn’t have any Dairy Queen or Carvel locations in our area, so Baskin-Robbins dominated the market.) Obviously, I ALWAYS had an ice cream cake at my pool birthday parties. Many years later and I still go crazy for ice cream cake. It brings back such happy childhood memories. And honestly, how can you beat the classic combo of cake and ice cream?! 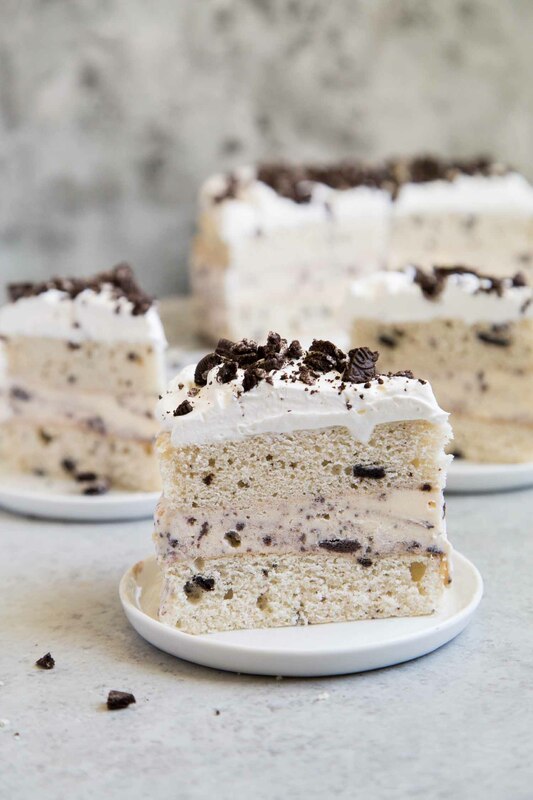 This cookies and cream ice cream cake was inspired by the confetti ice cream cake featured in Bake From Scratch July/August 2018 issue. It always amazed me how a cake could remain soft after being frozen with ice cream. The secret: thin cake layers! Thinner cake layers take less time to thaw and return to it’s original soft, fresh baked texture. This cake is baked using a standard half sheet pan– similar to the kind of cake used for making a Swiss roll, jelly roll, or cream roll. It results with a flexible sponge cake. You will have plenty leftover cake scrapes. Snack on them, or save them for other recipes such as cake pops or milkshake mix-ins. Use your favorite store bought ice cream or for extra credit, go ahead and use homemade ice cream! If using store-bought ice cream, allow ice cream to sit at room temperature for 10-12 minutes to soften. The ice cream should be pliable and easy to scoop. If using homemade ice cream, it is best to use the ice cream immediately after spinning/churning. At this stage, the ice cream is easily spreadable. 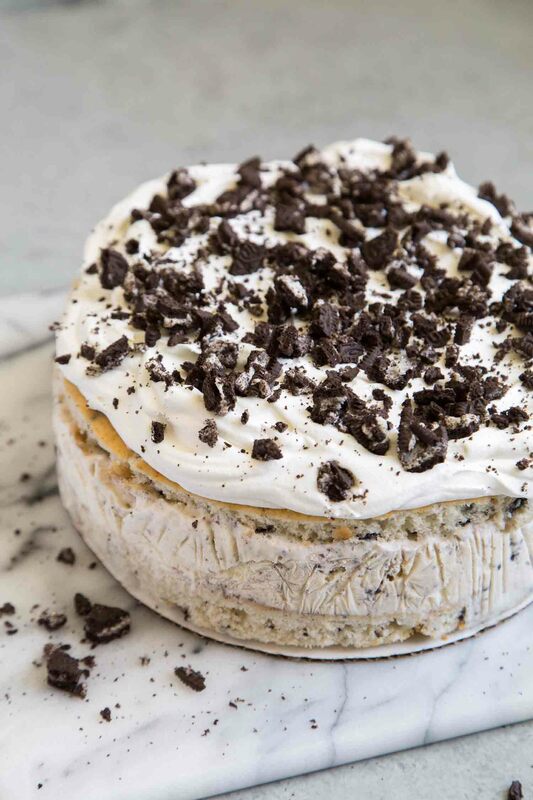 Whether you’re celebrating a special occasion or you just want a cool treat, nothing impresses quite like a cookies and cream ice cream cake! 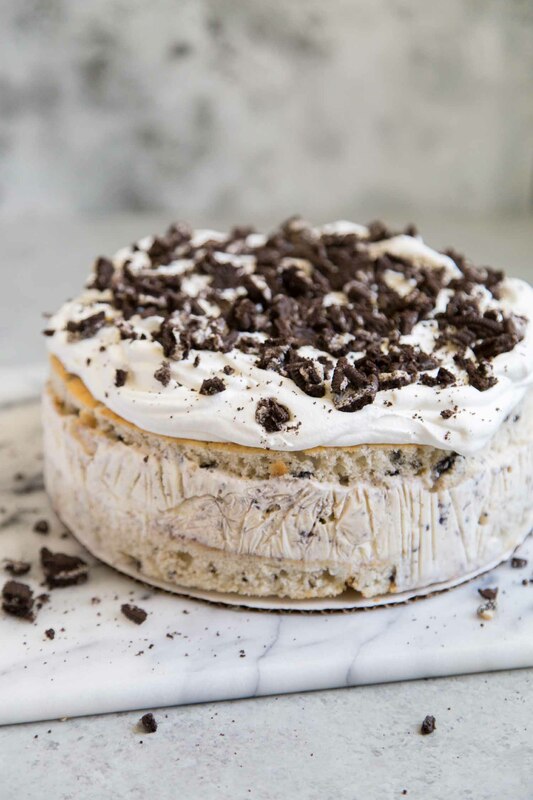 This ice cream cake can be assembled ahead of time and stored in the freezer for one week. (Don’t add the whipped cream or whipped topping until you’re ready to serve.) 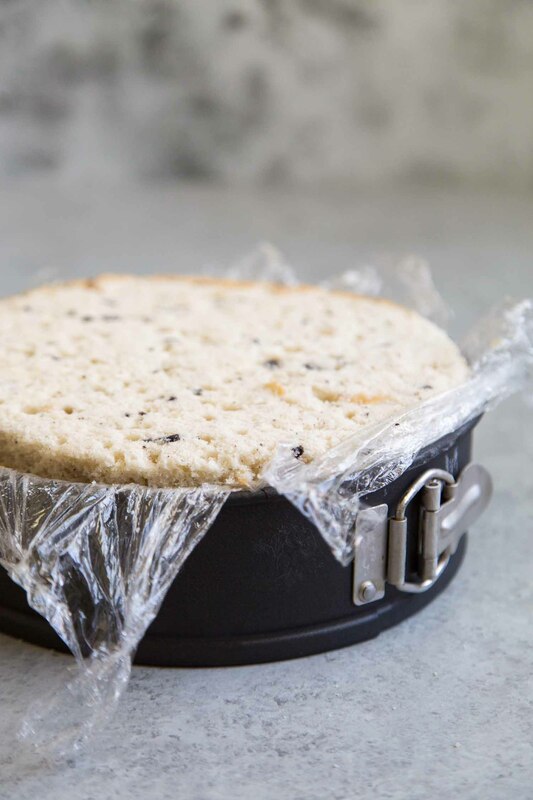 Be sure to cover the cake well with plastic wrap to prevent freezer burns. Preheat oven to 350 degrees F. Butter half sheet pan (18x13-inch) and line with parchment paper. Set aside. In the bowl of a stand mixer fitted with paddle attachment, cream together butter, sugar, and vanilla until smooth and fluffy. In a separate bowl, whisk together cake flour, baking powder, and salt. With the mixer running on low, add flour mixture in three additions alternating with milk. Start and finish with flour mixture. Scrape down bowl as needed to ensure thorough mixing. Fold in chopped Oreo cookies. In a large clean bowl, whip egg whites using an electric hand mixer. Start at low speed until egg whites are foamy. Increase speed and continue to whip to stiff peaks. Gently fold egg whites into cake batter in three additions. Cake batter will loosen as you add the egg whites. Transfer cake batter to prepared sheet pan. Spread into an even layer. Bake for 25-30 minutes, rotating pan midway through baking, until toothpick inserted in center of cake comes out clean. Allow cake to cool to room temperature in pan. Use a mini offset spatula or butter knife to loosen cake from pan. Use a 9-inch parchment round as a guide to cut out one layer of cake. Fold parchment round in half and cut out two half rounds using remaining cake. Immediately use cakes for assembly, or wrap in plastic wrap for later use. Note:There will be plenty of leftover cake scrapes. Save this to garnish the cake, or use for other recipes- such as cake balls, milkshakes, cookies. Line 9-inch springform pan with plastic wrap, making sure to cover up the sides. If desired, place a 9-inch cake board at the bottom of the pan. Place the two half round cake pieces at the bottom of the pan. Spread softened ice cream on top of cake. Top with remaining cake round. Cover with plastic wrap and keep in the freezer overnight to set up. 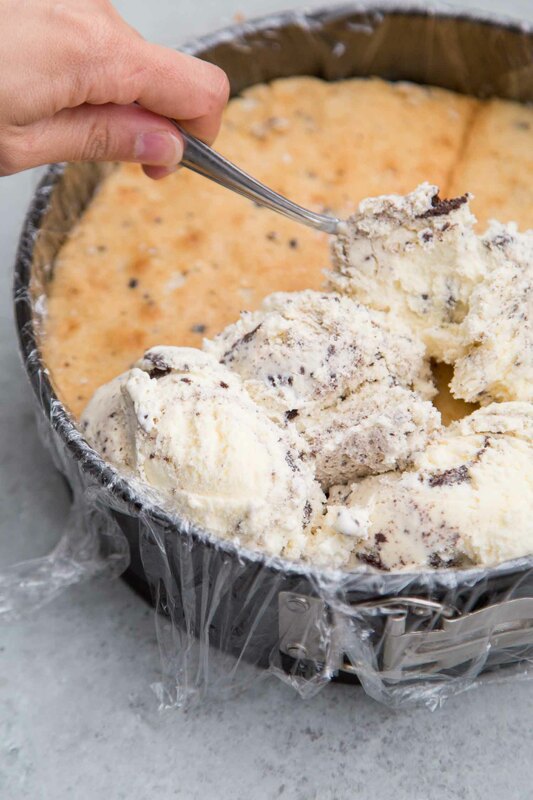 Remove ice cream cake from pan. Top with whipped cream. Garnish with additional chopped Oreo cookies. 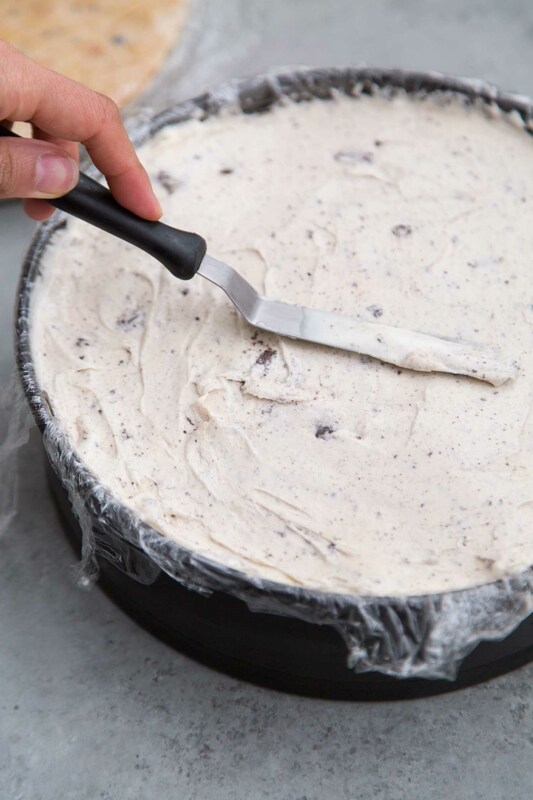 Allow ice cream cake to sit at room temperature for 5 minutes before slicing and serving. This cake looks awesome! I love ice cream cakes, brings back a lot of memories.